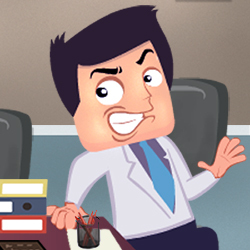 Office Games: John, the lazy worker is about to log out from his work and receives a call from his Boss for Extra work. John puts the phone down and is escaping towards the sky. His Manager and Supervisor are back of him to get him back to work. Help John escape his bosses and Emails and support him enjoy his freedom skyward. Left/Right keys = Balance Left/Right.